Do you have family members or housemates that hog the TV? Or perhaps you simply want the ability to watch Sky TV in another room? These problems can be easily solved by upgrading your Sky package with Sky Q Multiroom (Multiscreen) deals. How to get Sky Q Multiroom: Thanks to the new Sky Q box, getting and using Multiscreen is easier than ever! To buy, select your perfect Sky TV package using the comparison table, click 'Go' and you'll go to the Sky website. Then just add 'Sky Q Experience' for a mere £12/month plus setup. If you'd like to know more, read on below for information about Multiscreen. With a standard Sky TV package you get a single Sky set-top box. Because you need a Sky box to view satellite broadcasts, the basic setup only permits viewing on one screen. And moving the box around isn’t really practical, since you’d need a dish connection in every room (and you’d have to unplug the box and lug it around). But with Sky Q Multiroom offers (also known as Sky Multiscreen) you can get extra boxes for other screens in your home. These multiscreen boxes can be used to resume viewing on another TV, view live broadcasts, watch recordings stored on the main box hard drive and stream catch-up or on-demand content. And they do all this without preventing viewing on the main Sky box, so you can have simultaneous access to all Sky TV content on multiple screens throughout your home. 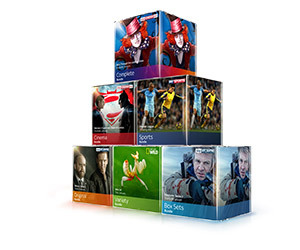 How does Sky Multiscreen work? Sky Q Multiroom gives you extra set-top boxes which function as independent playback devices separately from the main Sky TV box. This is now a basic feature built into the Sky Q TV box which replaced the old SkyHD technology. With the new box, Sky also introduced the Sky Q Mini box to act as a multiroom device. Not only are these a lot sleeker than the old hardware, but Mini boxes are wireless so they’re more flexible and easier to setup. Also, if you’re a Sky Broadband customer each Sky Q Mini box acts as a Wi-Fi access point, extending the coverage of your home network at no extra cost. With Sky Q Multiscreen you can have up to four Sky Q Mini boxes connected to the main TV box, and can view Sky TV content on up to two extra screens at the same time. For instance, you’re watching something on the living room TV and want to continue in the kitchen, you can simply pause on the main box and resume on a Sky Q Mini box using multiscreen. Or you can give the kids their own Mini box to watch their shows without interrupting your viewing. How much do Sky Q Multiroom deals cost? The basic cost for Sky Q Multiscreen is an additional £12 per month. This includes one free Mini box (but remember it is a loan and you may be asked to return the box at the end of your contract). Additional Sky Q Mini boxes come with a one-off fee of £99, but the monthly cost remains the same. Your Sky Q Multiscreen subscription also includes free access to Sky Go Extra, which allows you to view Sky content on a tablet or smartphone, so you can carry on watching your favourite shows and movies even outside the home.